Better late than never as they say! IPMS Middleton Cheney made its second appearance at IPMS Avon’s annual show at Thornbury Leisure Centre in South Gloucestershire on 7th August 2016. As usual for what is a large and always well-attended show, we had an excellent time. 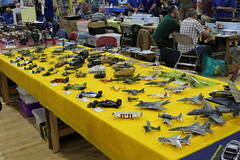 Of particular enjoyment at this particular event is the increased presence of wargaming. IPMS Middleton Cheney has historically maintained a good wargames following – it’s often how younger modellers get into the hobby and both club secretary Sam and webmaster James came through various Games Workshop games while growing up. Thus, we always do our best to accommodate any club members interested in worshipping the dice gods! At the IPMS Avon show there’s the opportunity to get involved with many different games and this year we thought we’d get in on the action and have a Dreadfleet game set up, using the set owned by club member Richard Coughtrey. For those unfamiliar with the game, Dreadfleet was a game made by Games Workshop for a short period from 2011. It is set within the Warhammer Fantasy world and places the players in command of ships sailing on the high seas of the Warhammer world. Here, both Sam and Richard are taking the game for a spin, and Richard was on hand to answer questions and provide information for the many interested parties. It was nice to be offering something different! But of course alongside the Dreadfleet game we had our regular display for 2016, the Star Trek 50th Anniversary set, with some of James’ F1 cars completing our spread. 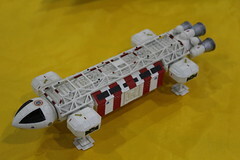 As always, the Star Trek feature caught many eyes, and during the day we were delighted to be offered the chance to display at the Sutton Coldfield Model Spectacular show in September. 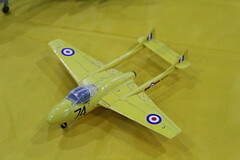 You can watch a video of our display from that show in the post below. You might have noticed that our regular tablecloths were missing! Unfortunately we forgot to pack them, and an early morning message to James to rustle up some emergency covers resulted in this. A spare curtain from his airing cupboard and a Marussia F1 flag. Not a disaster by any stretch in the end! The show itself was of a far better organisation, and our thanks go to IPMS Avon for once again putting on a superb event! Definitely one of our favourites for its size and variety, we’ll be back for sure!